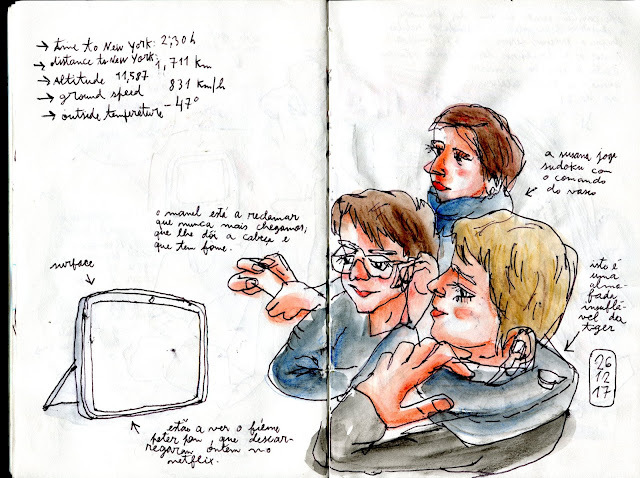 [Guest post by Nelson Paciencia in New York City] We got our flight from Lisbon to Dublin, and then to New York, immediately after Christmas, on 26th of December. 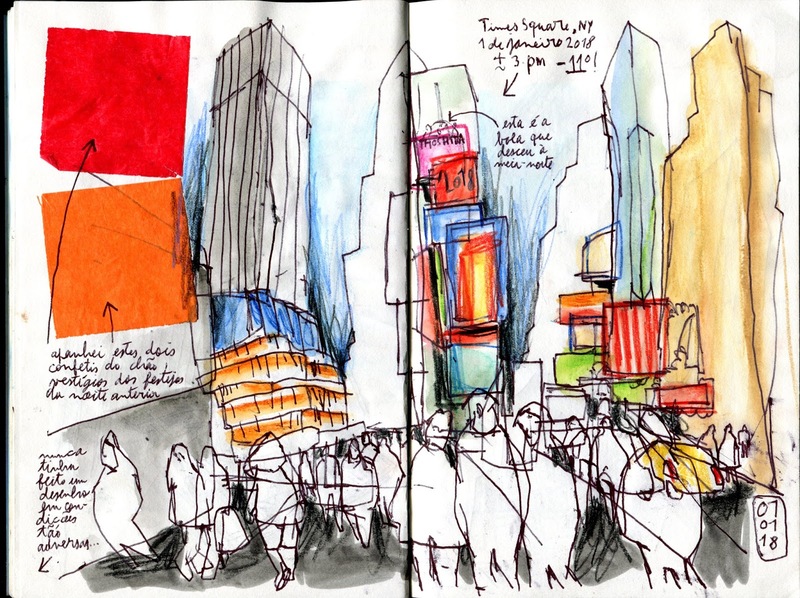 Me and my wife were in NYC twelve years ago, in a time we didn't have kids and I was not an urban sketcher. 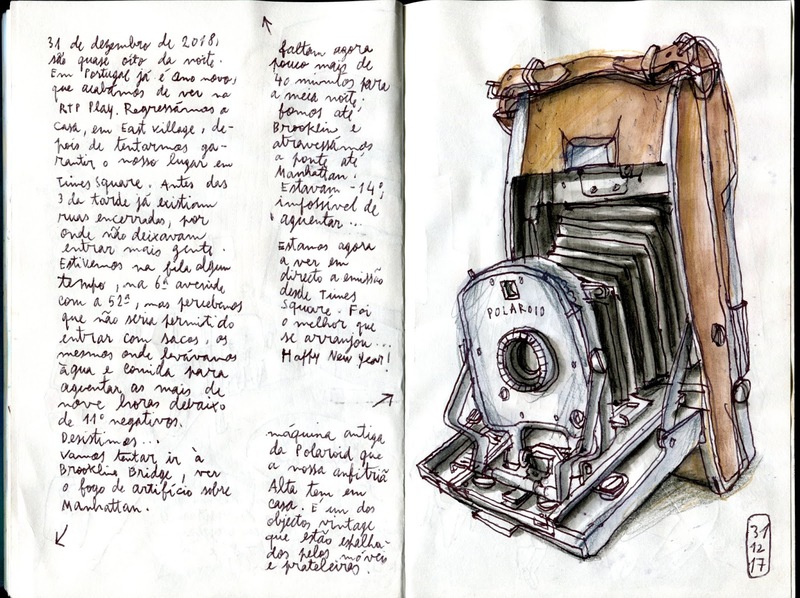 Two good reasons to return to one of the most fantastic and cinematographic cities in the world, and this time I knew that the story would have to be told differently. Our main objective was to spend New Year's Eve in New York! During our eight hour flight from Dublin to NYC, spending the time playing games, listening to music or watching movies and cartoons. After a long trip with connections (bad idea), we arrived in the magical city just before dinner time. It was -6ºC on the street, so the well-heated, lovely apartment in the East Village, built in 1900, was very welcome. It was already one o'clock in the morning in Portugal, we landed on the beds without dinner and unpacking luggage. We woke up the next day at five o'clock in the morning, jetlagged, and as we looked out the window and at the weather forecast, we realized that from that day on the temperature would go down a lot. The adventure was about to begin! Those who know me know that I like to tell stories, with an involvement and a personal stamp that can be recorded forever. And give them to read to others (but especially to myself) with a drawing done on location, which proves that I was there and that I stopped the clock of time for a few moments to do it. And that's the greatest pleasure I take from this incredible experience of being an urban sketcher. 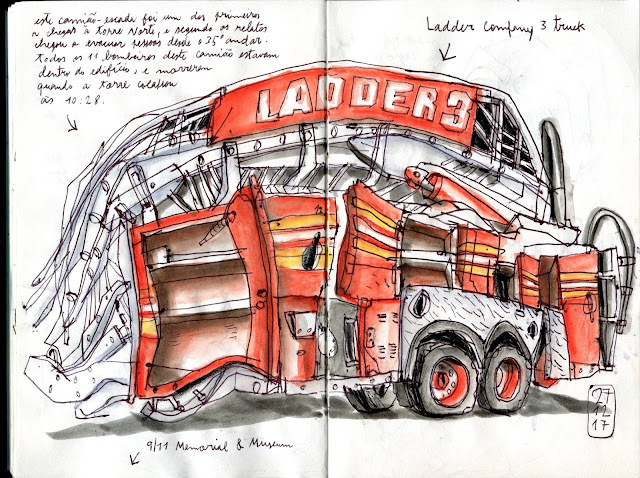 When preparing for the trip to New York, some weeks before, this ladder truck in the 9/11 Memorial and Museum was one of the things I knew already that I would capture for my sketchbook. I´m so glad I did it. 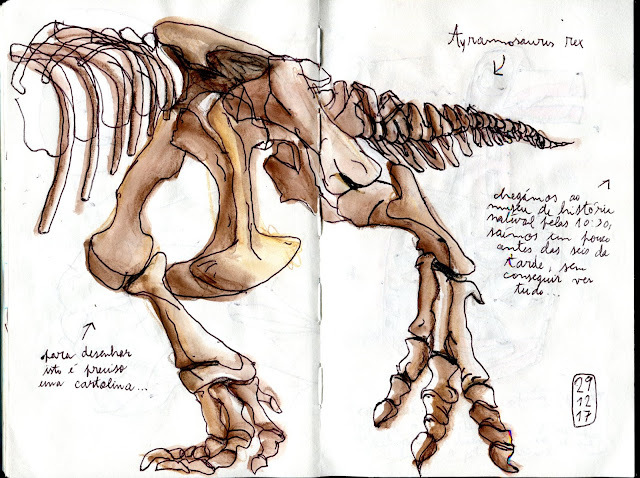 Natural History Museum - One day I need to take one of Lapin´s classes to learn how to draw a dinosaur properly. 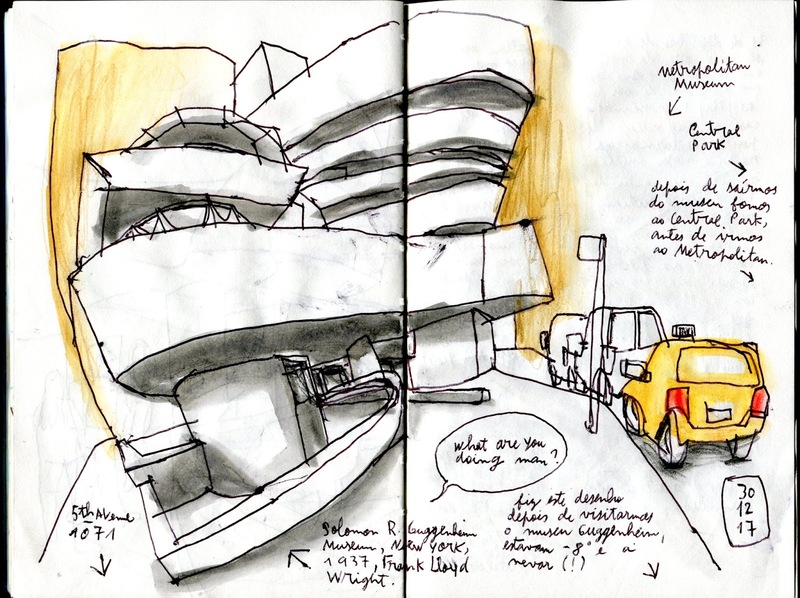 Guggenheim Museum – the masterpiece of Frank Lloyd Wright was the other place I knew I would draw during my trip to New York. This was done through snow and -8ºC, just before our visit to Central Park and, after lunch at the Metropolitan Museum. Our lovely house in East Village had lots of vintage objects, charming and irresistible. I took some confetti from the street to glue on my sketchbook, and I decided to try to draw, despite the cold and the wind. It was the first time I drew in such difficult circumstances, but I knew that no excuses were possible in this situation. The last complete day in New York. I decided to go for a walk, just on my own. I left the metro in Union Square Park and I decided to walk down 5th Avenue, a way to absorb the last hours in the city. 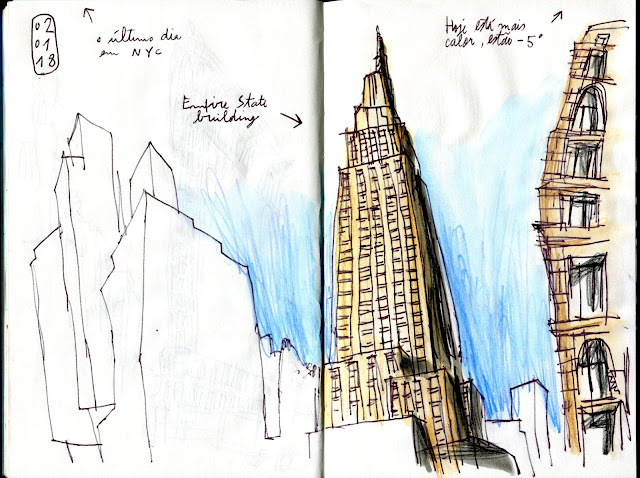 I stopped in front of the Empire State Building and I knew that my last drawing in this city was about to happen. I know for sure that I will not wait twelve years to come back again. Like some extraordinary people, some places need to be part of our lives once in a while, like New York City. Nelson Paciencia is married, a father of two boys, and lives and works as an architect in Lisbon. Nelson's drawings and stories can be seen on his blog or Instagram page.